System backup means saving a copy of your whole system, with all data, settings and applications. Handy Backup can serve as an excellent Windows system backup software, creating system recovery images in a bootable, readable and exploitable VHD format. Ideally, a procedure of system backup divides into the three stages. Each of them can bring some problems, often distracting a user from backing up a system on a regular basis. Let us see how Handy Backup removes all these problems completely. Some software (e.g. Handy Backup) saves a whole system image in a logical (file-level) or a physical (block-level) format, skipping no any single byte on a system drive. This action may require stopping the system, taking out the time! Logical format cannot be turned into a bootable image! Handy Backup takes snapshots of a working OS without stopping it. Handy Backup uses a physical-level format of system images. Users can keep files containing system images until these files will be needed for restoration, although thy can expect some difficulties with storing these files as a dead load. Files and other data from system images can be unreadable in physical format! A single copy of a whole system can have a healthy size, even more for a bunch! Handy Backup stores system images in a readable, mountable VHD format. In Handy Backup, you can always select a data storage of a suitable size for images. How to create a recoverable system drive using an image backed up? It is too long and uncomfortable to restore a whole drive to copy only a bunch of data! Handy Backup contains a special tool called Disaster Recovery (HBDR) to do it. You can mount an image created by Handy Backup as a virtual disk to browse it freely. Running a program as a Windows service, to remove distractions from users during a job. 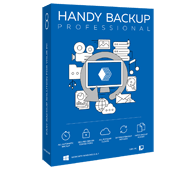 These and many other functions turn Handy backup into one of the most effective backup software, much more effective than a built-in Windows 7 system backup or a simplified solution in Windows 8.1. Handy Backup can save copies from any data existed, not only system images! How to Do a System Backup with Handy Backup? Open Handy Backup and create a new task by pressing Ctrl+N or by clicking a button. 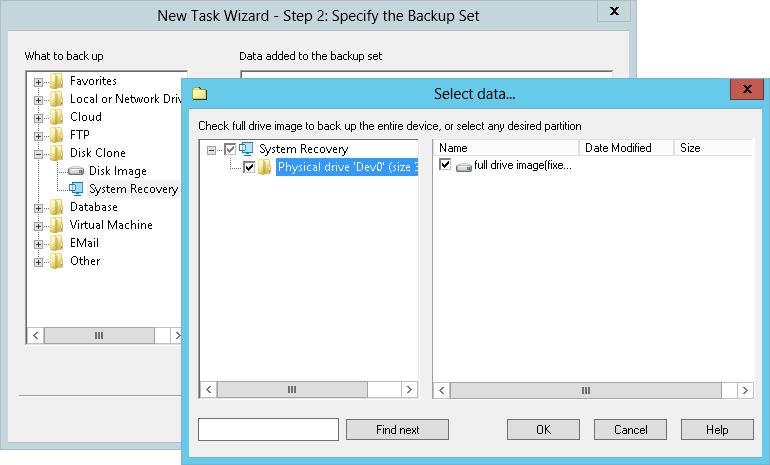 Select a backup task type, and then proceed to a Step 2. Double-click on a “System Recovery” option on the left panel containing data sources. Select a disk device you want to back up by marking a checkbox against it. Click OK and proceed to create other task parameters, as described in the User Manual. You can schedule your task on the Step 6 to run repeatedly at some exactly defined time, or by system starting or stopping, or even by plugging some specified external USB device to your machine to store a fresh copy of your full system backup. Note: When you are selecting a storage for your backups, please be sure that a selected storage contains enough free space to store a copy of your disk. Drive images often have a healthy good size! You can save a disk image using the System Recovery tool from Handy Backup, even if a disk is not a system drive. Obviously, you cannot turn such an image into a “bootable drive”; you can only map it to a physical or virtual machine to browse its content, or restore it. As Handy Backup copies data in a physical-level format, it can create a perfect image for a Legacy or MBR-based (Windows 7 and lower, most Linux and BSD distros). Also for a UEFI (Windows 8/8.1, Windows 10, some Linux editions and even a Mac OS X) bootable drives. Note: Modern versions of Handy Backup do not copy a BIOS boot settings, which can be actual for UEFI boot. Please back up your BIOS or keep all required settings manually or by a built-in BIOS backup utility, instead of Handy Backup system backup tool. The Professional edition has a System Recovery tool allowing backing up your system out-of-the-box. You can also get a Handy Backup Disaster Recovery utility in addition to this or upper solutions. Free 30-days trial version! Here are some answers to typical questions from different users planning to attempt a system backup. Are the Built-in Windows System backup Utilities Ineffective or Problem-making? All modern editions of Windows, including Windows 10, Windows 8 and Windows 7, contain utilities for system backup. These built-in tools are quite reliable, although long-running and somehow too simple, allowing almost no comfortable setting up the particular backup conditions. How Long a System Backup Takes Place? The procedure of copying an entire disk image cannot be quick as flash by definition. However, Handy Backup uses a Volume Shadow Copying service (VSS) to speed up a job, as well as allow a “hot” backup, requiring no stopping other operations on a particular machine during backup. Which Size I Can Expect from Backup Images? Roughly, you can estimate a size of your Windows image file as an equivalent of a used space in the disk you are planning to back up. You can see the amount of used space by clicking at a “Properties” option in the context (right-click) menu of your drive in the Windows Explorer. Can I Perform the Online System Backup? Yes, with Handy Backup, it is completely possible. You can save your system backup to OneDrive, Amazon S3, an FTP server or many other online storages available directly or indirectly in Handy Backup. The only limiting factors are the available space at your online storage and your connection speed. How to Back up Other OS Drives Using Handy Backup? You can back up the drive with other OS, plugged to your computer with Handy Backup running. The program saves it as a “data drive”; however, if this drive is bootable, its image will be bootable, too. In addition, Handy Backup Disaster Recovery (HBDR) can save an image of any OS.